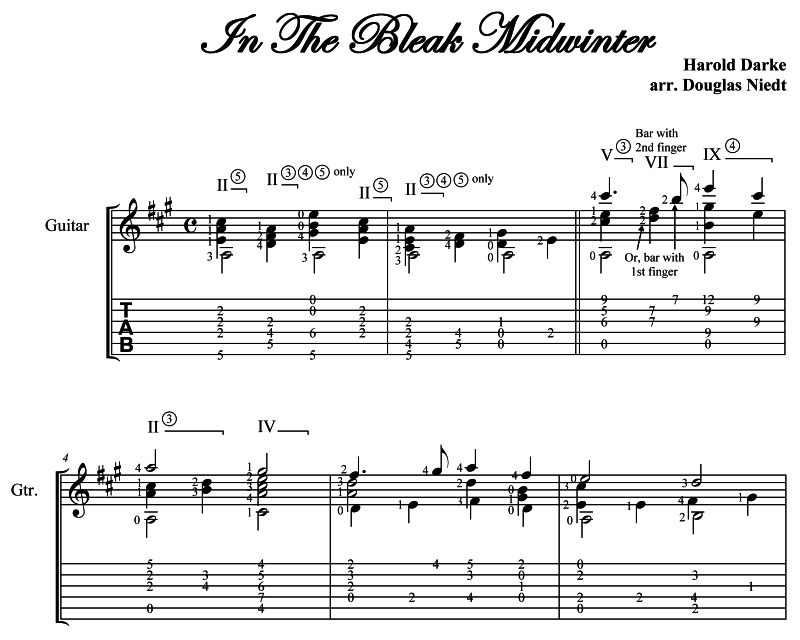 This is Douglas Niedt's guitar arrangement of the beautiful Christmas carol. Doug recorded two versions of the carol on his Christmas CD, In Heavenly Peace. This is the second version. 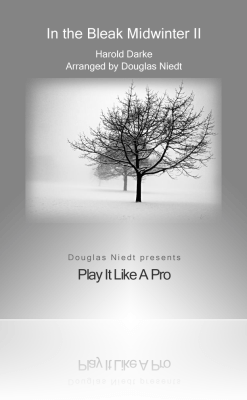 Learn to play In the Bleak Midwinter like a pro. Three videos shot close-up in high definition to teach you to play In the Bleak Midwinter like a pro, measure by measure. Three versions of the score and three detailed instructional videos. "These are the best video/internet lessons with the finest hi-tech production on the planet. But, if you are not satisfied with this course, I will refund your money. Just tell me why you didn't like it so I can make it better for others." After you order, within 24 hours you will be sent an email with a link to your personal webpage. The music files can be downloaded from your webpage. The videos can be viewed on your webpage and/or you may download them to your computers and devices. All files and videos will always be available on your personal webpage. Even though no physical product will be shipped, you will be asked for and must fill in your shipping address. Your email address is automatically captured when you order. This wonderful arrangement can be played on steel-string acoustic, nylon-string classical, or even electric guitar. Even though it may sound easy, it is for intermediate-and-up players. But it's gorgeous. You will receive the sheet music in several formats. 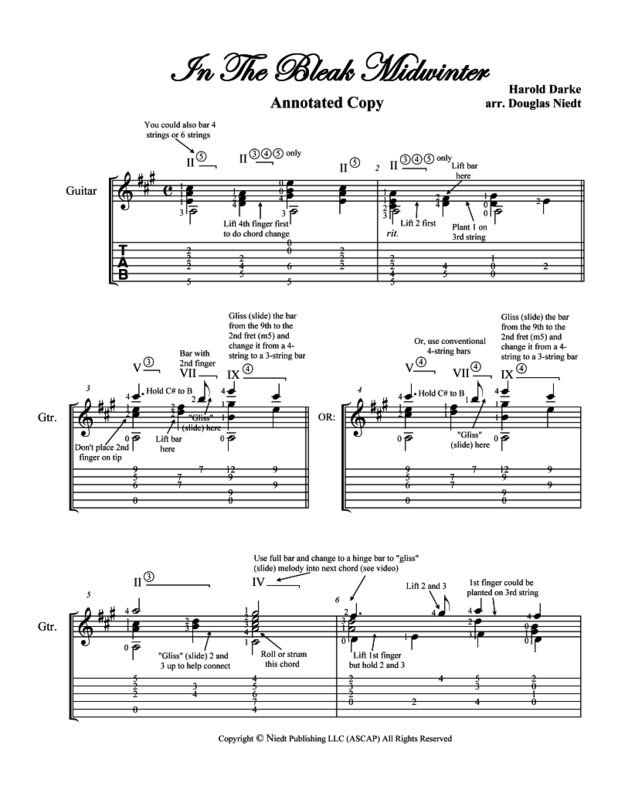 This is a sample of the basic version in standard notation and tab. By the way, the sample below is a web image. The PDF version you receive will be crystal clear. This version is marked measure by measure with detailed performance instructions, so you can masterfully play In the Bleak Midwinter II with pro-level execution. Again, the sample below is a web image. The PDF version you receive will be crystal clear. 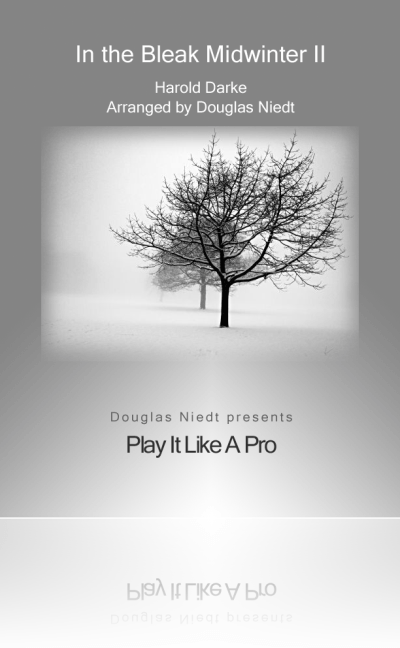 Doug gives you three detailed instructional videos to help you play In the Bleak Midwinter like a pro. Doug demonstrates how to play the piece measure by measure. These are not "put your finger here and then put your finger there" type videos. Doug explains all the technical and musical details required to play the piece on a professional level. Watch this excerpt as he explains how to play measure 7. Watch it on full screen--after pressing play, click on symbol in lower right-hand corner to the right of "HD". Buy now--one of the best guitar lessons you will ever have. It's complete and comprehensive. Includes the three versions of the arrangement plus three detailed video guitar lessons. The total package costs less than one guitar lesson in most cities.